Nottingham Northern Swimming Club is a friendly and competitive swimming club which welcomes both female and male swimmers of all abilities from the age of five years old. Training Sessions are held five times a week; three times at Harvey Hadden Sports Village and once each at Ken Martin Leisure Centre and at Nottingham High School. The club organises an annual Nottingham Northern Junior Open Meet in June each year - the 2019 date will be Sunday 30th June - and enters swimmers in a range of Galas throughout the year. WE ARE ACTIVELY RECRUITING SWIMMERS OF ALL AGE GROUPS TO OUR CLUB. FOR MORE INFORMATION CONTACT IAN FAHY AT HEADCOACHNNSC@GMAIL.COM. NORTHERN JUNIOR OPEN 2019: Entries are now OPEN for the 43rd Nottingham Northern Junior Open. This is being held on Sunday 30th June 2019 in a 25m pool at Harvey Hadden Sports Village in Nottingham, with events for swimmers aged 9 to 14 on the day. There will be boys and girls events in all four strokes over 50 metres, with heats and finals for the top 8 in each age group, and the 100 metre Individual Medley with heat declared winners. In each age range there will be trophies for the top 6 in each event, as well as Top Club, Top Boy and Top Girl trophies to be contested. A fun, exciting day of competition for junior swimmers is planned, and all details and entry forms can be found on the Northern Junior Open 2019 page. There is also now an accepted entries list showing all entries submitted so far - please check that your entries appear correctly. EASTER 2019: There will be no training sessions on Thursday 18th April, Friday 19th April, Sunday 21st April and Monday 22nd April 2019. POOL CLOSURES: Due to pool closures at Harvey Hadden Sports Village, we have moved some of our Sunday sessions to John Carroll Leisure Centre, Denman Street Central, Nottingham, NG7 3PS. We will begin at the earlier time of 12 noon, finishing at 1 pm. T2 group will be in the teaching pool from 12 - 12.30 pm and those who normally swim in the first session the time is 12 - 12.30 pm and the second session is 12.30 - 1 pm. There will be no training on Friday 26th April 2019 due to a synchronised swimming championships taking place at Harvey Hadden. If any training sessions have to be cancelled due to any unforeseen circumstances, announcements will be issued by email. Please ensure the club has an up to date email address for you to ensure you receive alerts. BANK HOLIDAYS - MAY 2019: There will be no training sessions on the Bank Holiday Mondays - 6th May and 27th May 2019. NOTTS ASA SUMMER GALA: This year's Summer Gala will take place at Harvey Hadden on Saturday 13th and Sunday 14th July. This uses a 25m pool with distances from 100m to 400m. Please see more information and get your entries in as soon as possible as this often fills up. 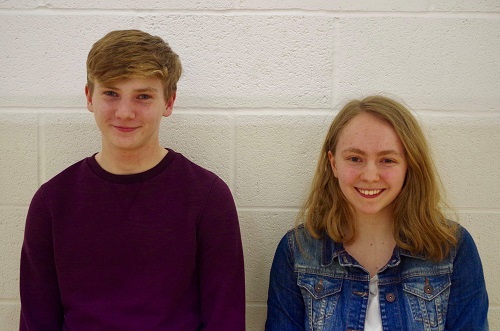 CLUB CAPTAINS: Congratulations to our new Club Captains, Eoin and Grace, elected at our club Annual General Meeting on Wednesday 27th March 2019. TIME TRIALS - MAY 2019: The club will be holding licenced Time Trials during training sessions in May 2019 - on Monday 13th May at Ken Martin and on Friday 17th May at Harvey Hadden. Entry is free - please download the programme and then complete and return your entry form before Friday 3rd May. Swimmer of the Month - March 2019: Congratulations to Ben Pridmore - March's Swimmer of the Month. Great effort, determination and attitude! MICHELLE HAMMOND - SPONSORED 5K SWIMATHON: Our coach Michelle is swimming 5km on 31st March to raise funds for Cancer Research. Please considering supporting her here. Club Newsletter - January 2019: Please read the latest edition of the Northerner. Time Trials - Monday 17th December 2018: Congratulations to the swimmers who achieved new PBs at the Time Trials in December. For results see the Swimmers Page. Results were also published to the Swimming Rankings database. Book your places in advance with the team on the desk at training sessions. Presentation Evening 2018: Our annual presentation evening is now over for another year. Photos from the event are now available via the Swimmers Page. 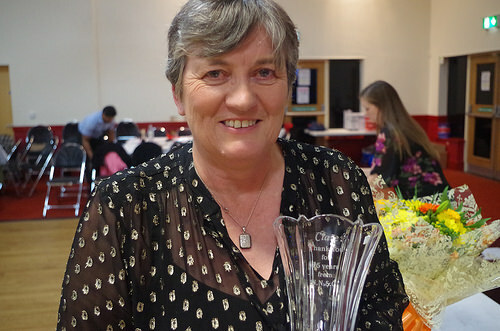 Congratulations to Club President, Clare Soar, for her 25 years of service to the club! This milestone was marked at the Presentation Evening with flowers and an inscribed vase. Club Champs 2018: Congratulations to all the swimmers for your achievements, including many new PBs and thirteen Club Records broken! Thanks to all who helped in organising the events. Updated PB lists are now available on the Swimmers Page. Here are the Club Champs 2018 Complete Results and the updated Club Records. Swimming Teacher Level 2: Congratulations to Michelle Hammond for achieving her Coaches Level 1 Qualification. Well done! Remember you can find out about all our coaches and teachers here. East Midlands Club Newsletter - September 2018: Please follow this link to keep up to date with activities organised by Swim England East Midlands: East Midlands Club Newsletter September 2018. Cardiac Screening: Cardiac Risk in the Young offer subsidised heart abnormality screening to young people aged 14 to 35. For more information or to see a list of free screening sessions in our area, visit their website. Meet the Team: Please find photos and info on all our current coaching and teaching team on the Meet the Teaching and Coaching Team page. Training Equipment: Training Equipment is now available to order from the desk on Fridays and Sundays. Please see the Swimming Equipment page for details of all the club's clothing, bags and training equipment. New Club Structure: My coaching team and I have been reviewing the club structure, with the aim of simplifying it as well as adding in more swimming time for our younger swimmers. With effect from 1st January 2018, our swim session groups will be changing. We are introducing age group squads; Junior 1 & 2, Intermediate 1 & 2 and Seniors, which will follow on from our Teaching Groups 1 & 2. Although we will try to keep to age groups where possible, entry into these groups will also be based on technique, attitude, attendance and times, and so swimmers may be invited by myself to train in a higher squad. Squad reviews will take place periodically to help ensure swimmers are progressing in accordance with expectations, aspirations and ability. Please see the Training Schedule for the times of each group's sessions and details of the aims of each group. As always, please feel free to contact me should you have any questions or concerns. Best Wishes, Ian Fahy, Head Coach, Nottingham Northern Swimming Club. Teaching and Coaching Incentive Scheme: The club has introduced a NNSC Teaching and Coaching Incentive Scheme to encourage more parents and swimmers to become teachers and coaches. Friends of Northern: The club has launched a "Friends of Northern" group to help former members keep in contact with the club. Please read more here. Nottingham Northern Joins Facebook! From Ian: As the Head Coach of this great swimming club, may I encourage you to like our new Facebook page and view it regularly. On here you will find important club updates, videos of up and coming training drills which we will be using, and so much more. Please get connected today! Visit www.facebook.com/nottinghamnorthern. Sport Nottinghamshire: Keep an eye on the Sport Nottinghamshire website for news and updates on sport in our county. Just Swim app: The ASA have recently launched a new Just Swim website and app. It has three key sections, all of which have been developed to suit both the novice and the more experienced swimmer: distance goals, calorie burn goals and tips and advice for a better lifestyle. Visit the Just Swim website for more details or to download the app. Are you receiving emails from the club? If no one in your family is getting regular emails from us please check at the front desk that we have your correct email address. We email around important information about the club regularly. We do not give your email address to anyone else.